Last spring, I planted a few different plants in a small square raised planter that surrounds my mail box. But I was never happy with the look and decided I wanted a climbing plant to cover the post and grow up around the mailbox itself. I wanted a perennial that would come back year after year. This year, I decided to plant Clematis. 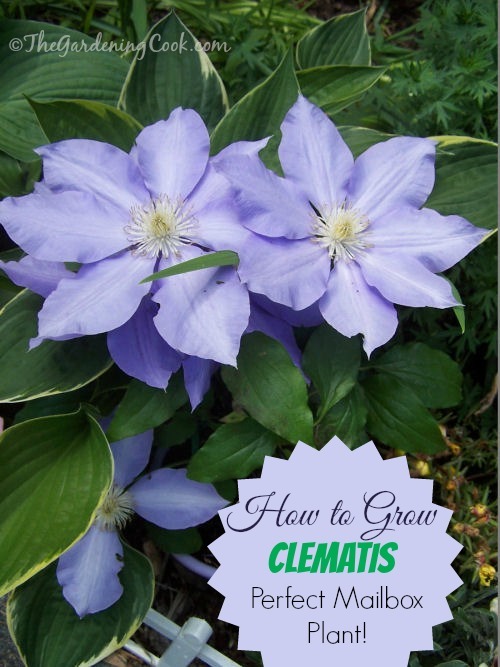 Growing Clematis plants is easy with these few steps. Clematis is a perennial and some varieties will get really large, so it is important to keep this in mind, particularly if you plan on growing it in a pot. Some varieties will grow 15 feet or more, so may need regular pruning to keep it in check. Water when the top of inch of the soil is dry. They need about an inch a week. Clematis is susceptible to fungi that can cause the vine to suddenly wilt and turn brown or black. Carefully prune out all diseased tissue and disinfect your pruners with a bleach solution. To promote re-flowering a second time during the growing season, the vine can be cut by one-half after the main bloom period. Provide the clematis with good support. Once the vine starts growing, gently tie them onto the support using twine or yarn. Proper vertical support will allow your clematis to become bushier and taller, leading to more foliage and a greater amount of flowering. 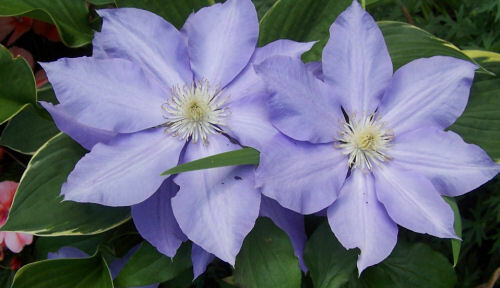 Clematis can bloom on old wood, both old and new wood, and new wood only. Pruning needs to done depending on which variety you have. Mine blooms on old wood, so it should be pruned as soon as it flowers. Those the bloom on new wood only, just remove growth from the previous year. And if it blooms on both old and new, prune once it gets crowded. The plant is quite hardy. Mine will take temps to -30 degrees Fahrenheit. This is my beauty. Can’t wait to plant it near the mail box. Hopefully this week! good idea. I love hostas too! You have inspired me to give these a try. I am goin to plant these around my deck providing I can find them. I got mine at Walmart this year. I just bought two small clematis plants at my local Home Depot and plan to plant them by our mailbox, which is next to the road on a post. I assume the best way to give them the support they need is to install round hooks in the post and string wire or twine between the hooks. Any feedback on my plan would be much appreciated. I have always wanted a clematis, but never had the proper conditions and now I think I do, so I’m very excited to plant these little gems. I am sort of in the same situation. I killed the first clematis I had last year, This year I also bought one at Home Depot. It has a trellis in it but I bought a larger wire trellis from the dollar tree and will use that. Your idea should work though. I use string like that for beans and cucumbers and they climb on it just fine. Clematis has tendrils sort of like theirs. I think I have one exactly like yours! It’s the biggest/best blooming one I have. Nice post and your blooms are lovely. These are beautiful pictures. And a lovely post. I am always curious how the clematis winds to nicely around the mailbox posts. Hello. 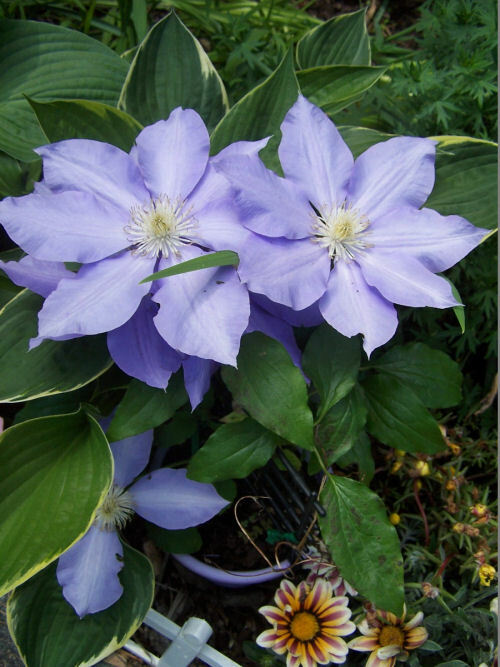 It depends on where you live but generally, no, clematis is a perennial that dies back in the winter months. If you live in tropical zones, it way stay green and flower through the whole year. I have grown clematis for a couple years and love them. I have been looking for this exact color as you have pictured and have had no luck in finding this shade. Do you know the name of this particular variety? I’d appreciate any info on this. Thank you. If my mailbox and post-surround are plastic (fits over a wooden post, but the wood is not exposed), will clematis not grow and thrive? If it will work, do I provide a trellis right away, or will supporting clematis by tying it as it grows to the mailbox suffice instead of a trellis? The mailbox is on the west side of the property and will get sun from 11-12 on then all afternoon. Is that too much? Is there a concern for overheating the roots? I have some clematis climbing on a plastic trellis right now. I don’t think that will matter. It is easier to get it to climb with a trellis but it will attach and climb around most anything. It’s pretty persistent in this regard. Mine is sitting in the sun right now, but it does get burned here in NC from too much sun. I don’t think the roots will suffer, but the leaves may from that much sun. How many plants to start out, just one, two (one on either side), or four, for each of the four sides? Hi Kevin. I would start with two. I bought one last year that I have in a largish planter. It is really big this year. I think four would be too many. Four would be a good show this year, but maybe too many next. So you don’t plant in ground? You keep in planter, then bring inside for winter? do all clematis bloom all year? Mine only blooms in the spring and early summer. Do all clematis bloom all summer? Mine only blooms in the spring and early summer. I would like it to bloom longer. So do i need a different one?